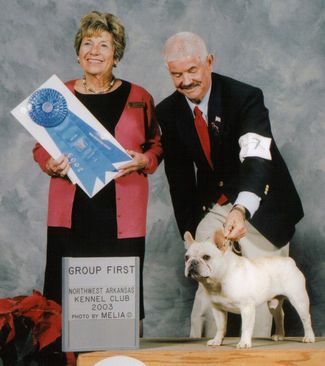 Buddie takes a Group 1 at the Fayetteville Arkansas show under judge Elaine Rigden. Buddie is semi-retired with a very impressive show record. He is producing very typey, sound kids with his flawlessly correct movement. Buddie was shown on a limited basis by his breeder/owner. Made three cuts at the Frenchie National in September 2004! 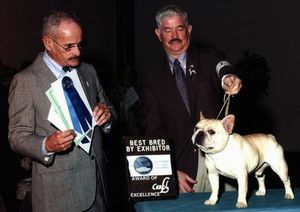 Buddie winning an Best BBE and an Award of Excellence under judge Richard Bauer. Ch House Of Tucks T-Ann, "T-Ann"
Ch House Of Tucks Mr. Cox, "Coxey"
Ch House Of Tucks Josey Wells, "Josey"
House Of Tucks Buttons, "Buttons" - Major Pointed 1st show out but lost in a very unfortunate accident. 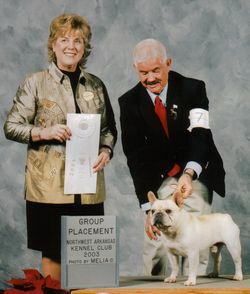 Ch House Of Tucks Mrs Cox, "Sissy"
Ch House Of Tucks J & JG, "JJ"
Uptown With House of Tucks Bud, "Rambo"
House Of Tucks Buddies Boy, "Boy"
Buddie takes a Group 4 at the Fayetteville Arkansas show under judge Karen S. McFarlane. Copyright © 2003 - 2007 House Of Tucks French Bulldogs, Doherty Kennels & JLS Canine Services Web Design.